This past weekend my husband, Matt and I, traveled to Edinburgh to celebrate our first anniversary. Little did I know that the small getaway we planned during a trip to England for Christmas was a city so rich in urban planning history. I honestly didn’t have any expectations of this capital city and didn’t know too much of its history or appearance. My first impressions were of slight disappointment; many of the stone buildings were black with soot, giving the city an unloved appearance, people weren’t too friendly, and the city streets were absolutely lifeless for a Saturday afternoon. In the present time the city is apparently less affluent than other cities in the UK, obviously London, but most of its surrounding towns as well. Matt had a clear explanation for this: it’s January in Scotland, it’s freezing, there’s little sunlight wouldn’t I be snuggled up at home in front a fire as well? He had a good point, because as I’m writing this post in a Starbucks on a Monday afternoon, the city centre has appeared to become much more alive. As I learned about the history and development of the city, my interests and my impressions peaked. Perhaps with a strong Scottish ancestry (my maiden name, McGirt is bastardized from MacCart, part of the Scottish McArthur and Campbell clans) I could almost imagine myself in the city centuries before. Perhaps the most fascinating thing about Edinburgh is that it is clearly split between the Old Town, the original and oldest part of the city, and the New Town, which was designed and built from 1765 to 1850. These two areas, while both connected and legible, feel completely different. This is emphasized by the Nor Loch, a drained valley once filled with water, which acts as a physical separation between the two. This fact in itself will certainly ensure that the young James Craig’s design will continue to be recognized as the first modern planner in Edinburgh for centuries to come. The common tourist can pick up the differences between the two parts of the city within an hour. The Old Town is like walking through a small village in the countryside: small winding streets, narrow pedestrian gaps, and modest leaning buildings. It clearly is ancient and was built organically over time with little planning. With bagpipers and tartans lining the streets its hard not to imagine that you are in a scene from Braveheart. It’s quaint, charming, and feels very Scottish. The first development of the New Town in contrast has wide roads organized in a strict pattern with stately Georgian buildings. It feels elegant, orderly, and European. The simple axial grid is bound by two boulevards, including the famous Princes Street, that link together drained Nor Loch bordering the Old Town and the green fields beyond (now the Queen Street Gardens) and butted by two stately public spaces, Charlotte’s Square and St. Andrew’s Square. While it originally was planned as a suburb, the area became so popular that commercial and other mixed uses soon filled the ground floors of the buildings. The New Town expanded north, east, and west over 100 years in the vein of Craig’s design. It was classical in its organization and unfortunately traditional in its social influences: the rich moved to the large countryside homes and the poor remained in the overcrowded squalor of the old city. Matt and I were able to witness this first hand by going on a tour of St. Mary’s Close, underground and preserved in its 18th century state. Closes were narrow streets of about 6 feet with tenement houses, sometimes 7 stories high, on either side. This is where the majority of the Edinburgh population lived in the old city. The higher up on the hill the richer you were, the lower on the hill, the poorer you were. You were reminded of this twice as day as everyone who lived above you disposed of their excrement and it ran down the close to the polluted Nor Loch. With 12 people living in a 10’x10’ room, the plague spread rampantly. The resulting realization by the wealthy that these conditions had become unhealthy, led to the need for the urban planning profession in Edinburgh. It was fascinating to witness the preservation of the old and the celebration of the new so clearly in the 21st century. In so many places the augmented city grid, redevelopment, and modernization hides the boundary between pre-planning and planning. The result can be a muddled cultural identity. It was a joy to be able to see clearly the before and after in one city. This can allow Edinburgh residents to more easily understand and connect with their heritage: a gift that many cities don’t benefit from. When people can do this they can have a clearer sense of where they came from, who they are, and how they fit into their community. 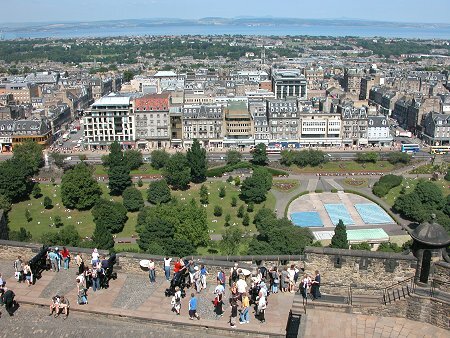 While Edinburgh clearly preserved their past in the Old Town, they designed the New Town looking forward to a new identity during the Scottish Enlightenment. Perhaps the residents moved forward in the same manner, mirroring the impressive modern development of the city. I have to admire the Scottish Enlightenment planners who acknowledged the inadequacy of their urban fabric and solved it so drastically by engineering their land through the drainage of the polluted Nor Loch, creating the Earthen Mound, a large mound of dirt and the North Bridge, to connect the Old and New Towns, and designing the New Town with an elegance that has stood the test of time. Edinburgh’s boulevards, open public gardens, distinct perimeter blocks, and stately Georgian architecture solidify Edinburgh’s identity as a proud European city for generations to come. ← Urban Never Tasted So Good!